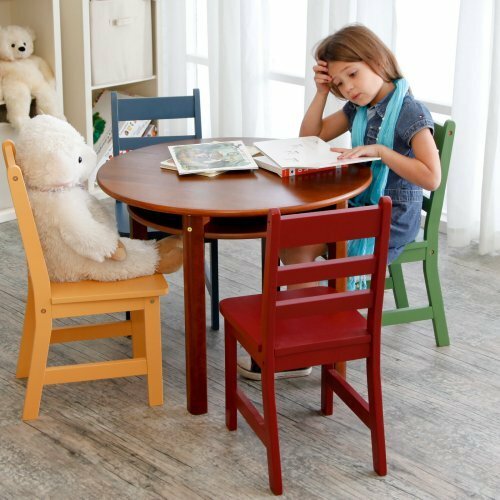 Extremely sturdy and features an entire rainbow of different options, this beautiful Walnut Round Table and 4 Chairs is ideal for any child. The table and chairs are made of sturdy beechwood. They are designed to handle all the rough and tumble usage from your kids. The table features a classic Walnut finish and each chair features its own bright color of blue, red, green or yellow. A recessed lower shelf provides the perfect storage spot for small toys, books, or drawing supplies. This gorgeous table and chairs set will bring a new dimension of functionality to any room. Excellent for puzzles, tea parties, and hours of fun. Perfect for ages 3-7 years old. If you have any questions about this product by Mulberry, contact us by completing and submitting the form below. If you are looking for a specif part number, please include it with your message.